The designer Tanja Berlin offers a detailed instruction booklet for this Iris design and you can send photos and questions to her as you work the piece. Midway through my stitching these two pieces I sent an email to Ms. Berlin and her remarks were very helpful. I studied and closely followed the 18 pages of instructions and illustrations over the months I stitched these pieces. Plus the cover page for Ms. Berlin’s instruction book has a high quality photo of the actual size stitched design and she has photos of this design stitched by others like us on her website which I viewed for ideas several times as I worked this design. Both of these were fun to do and Ms. Berlin’s detail booklet has greatly enhanced my understanding of thread placement and color blending (of the threads) as I stitched. Finished Design size: 5 inches by 3.5 inches, drawn fabric provided was 11 inches by 12 inches. Design is drawn on southern belle cotton muslin fabric. When you purchase the Iris kit from Ms. Berlin you can purchase an extra piece of fabric with the Iris design drawn. Knowing bearded Iris are my favorite garden flower, I purchased two of these extra fabrics. I still have one to stitch and plan to wait until spring time view my Iris as they bloom and select the colors of one to use in my third worked piece of this design. 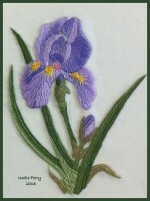 Click here to view a side by side photo of the DMC worked and crewel yarn worked Bearded Irises.